Don’t these uniforms historically lose? Seattle is 2-3 in this combo. Won in 2012 and 2013 in games at Carolina. Lost in 2012 at Miami, 2014 at San Diego, and the 2016 playoff game at Carolina. I actually like the Chargers all white, but they wear them too much. Let the white over navy get its share in the spotlight. To look like retro patriots? Do you have Madden 19? 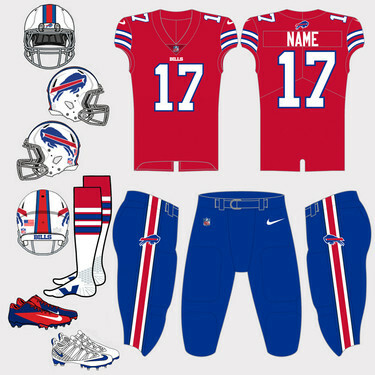 On the first concept, and if it were only for one game I could live with it if you used the socks from the second concept but perhaps modified them to have the striping match the jersey stripes.. Also, I'd like to see Nike make the belt on the pants red like the days post-merger. On second concept, no thank-you. The 100th anniversary should be a good time to test the waters (for lack of a better word). 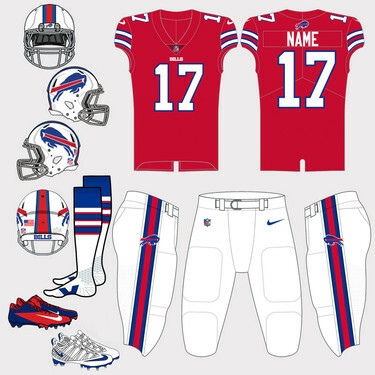 I’m pretty sure that before 2013, the rules were that you could only have an alternate helmet for Throwbacks, and that the Home, Away, and other alternate must use the standard helmet. That’s why the Seahawks dropped the idea in 2002 of using Blue lids at home, and Silver in the road. The Seahawks look about 1000 times better in gray pants. Grey pants would look much better with green, just like how it is on the blue pants. Yup. Fill those goofy little shapes with green and burn every other pair of pants.